The Disneyland Resort in Anaheim, California stands apart from Walt Disney World thanks to all of the original shows and live performances. One of them that stands apart? 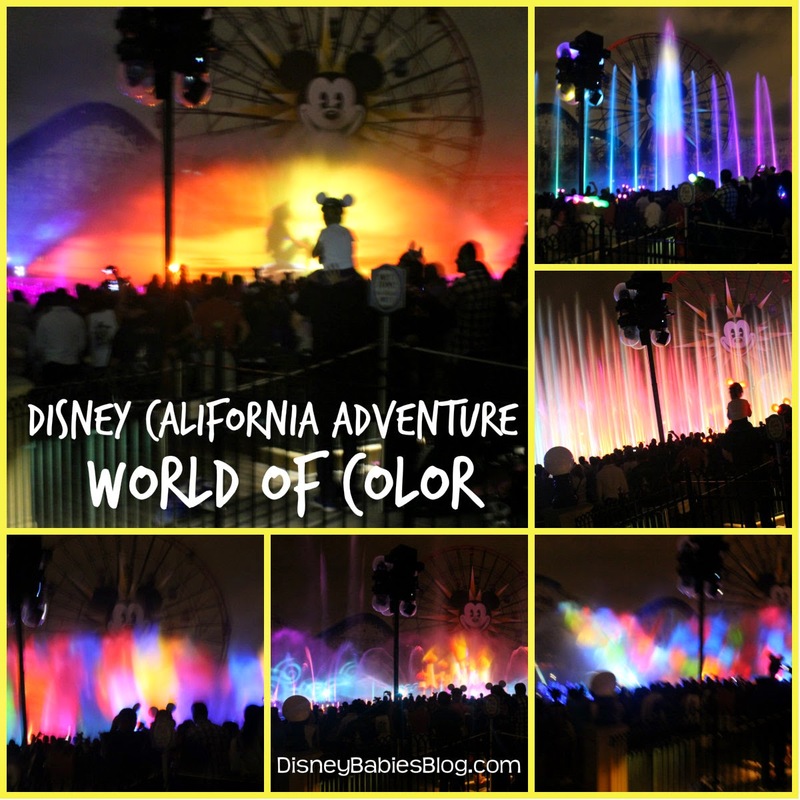 Located in Paradise Pier at Disney California Adventure, World of Color is a water light spectacular - no fireworks needed for this park. This evening show is visually stunning with only water, lights, colors, music, and projected images! I'm sure times change throughout the year, based on park hours and light, so check your Times Guide for show time! An unattached fastpass (i.e. this fastpas will not affect you getting another fastpass immediately) will give you a designated viewing area. Guests at Disney's Grand Califonia Adventure can enter the park first thing from their resort entrance (enters from resort directly into the park!) to beat the rush to get these fastpasses. World of Color fastpasses designate a viewing area and return time prior to entering the viewing area. These 3 course, prix fixe meals will give you a fastpass into the same viewing area as the fastpass. The fastpass gives a 1 hour return time window, approximately 1.5-2 hours before show time. The line was long when we arrived, and after waiting in that original line, they finally open up the viewing area to everyone. Though we weren't near the front of the line, we walked to what seemed like a good area and got comfortable. A center viewing section was roped off, but we were as close to center as possible. **Note - don't go too far down unless you want to get wet!! It is a water show and those that go as far towards the water as possible are warned that they will most likely get wet! 45 minutes prior to show, log into the free wifi PierGames and play the Fun Wheel Challenge! This online pattern memory game requieres no downloads or apps, but the winner gets to control the colors of Mickey's Fun Wheel for 30 seconds! Collectors of Mickey Ears may like to invest in a pair of Glow with the Show ears that will change colors in unison with the other lights around you during show time (also works for Fantasmic)! The World of Color viewing area has stationary lights that change colors as well, but the lighted ears are definitely fun to watch! The show starts and ends with an original song, but the rest of the soundtrack is familiar music. The colors and effects are phenominal. During the show, expect to hear and see some of your favorite characters - note Ariel in the above photo! While Mickey's Fun Wheel is stationary and unchanging, the center of California Screaming is utilized as a background for different images throughout the show (think Celebrate the Magic show on Cinderella Castle). The designs the colors make are so engaging, it's hard to believe that it's a 28 minute long show! You'll notice that the Glow with the Show ears aren't prominant, but still fun to watch - as are those white bulbs you may notice in the bottom pictures! 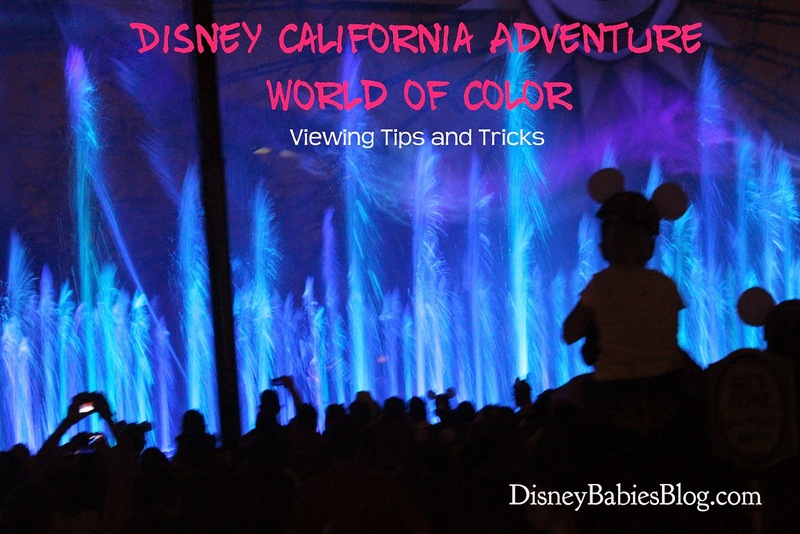 Do you have any tips and tricks for World of Color? What are your favorite viewing spots? OR - would you like to plan a Disneyland trip? I would LOVE to help you! Email me JennL@thewdwguru.com for your FREE travel planning help!